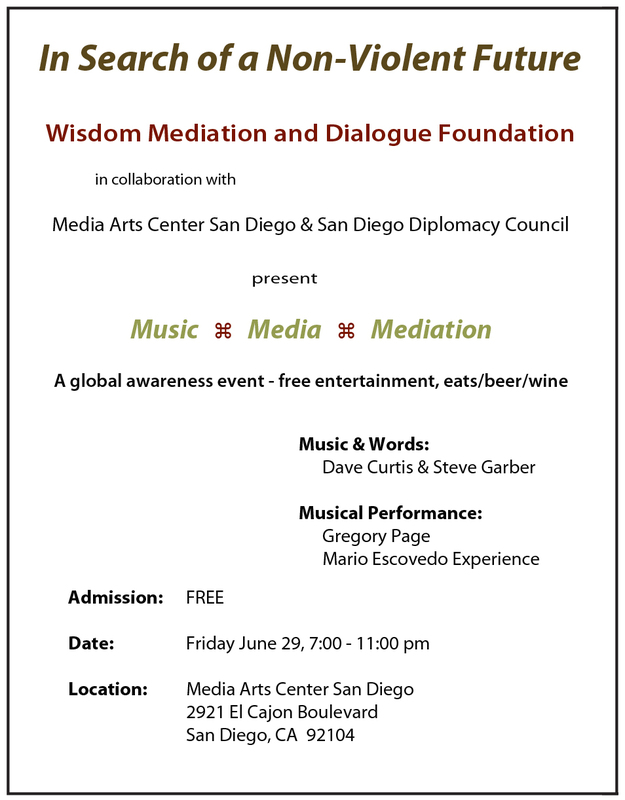 Free entertainment: three separate musical and spoken-word performances, beer, wine and food. Guests, if they wish, will have the opportunity to offer “I’m sorry” statements while being videotaped by WMD members and volunteers (scripts/prompts will be available on table “menus” for those who prefer to use them). The objective is to create 50+ videos from a culturally and generationally diverse group for use in establishing an open dialogue and mediated discussion between American and Iraqi citizens in an upcoming WMD workshop series as well as encouraging cross-cultural and international dialogue via social media. Please join us on this journey of human dignity & hope, celebrating the compassion shared by all humanity. Good to hear from you. I hope all is well and that you are in good spirits. Maddy begins Law School in August and is doing well. We had an event on Friday the 29th that was well attended and hope to do another sometime in September. The Wisdom, Mediation and Dialogue Foundation also has a Face Book page under wmdfoundation.org. The poetry, along with the more than twenty five years of Aikido (Japanese martial art) and Zen meditation have brought me to this particular path and I am enjoying pursuing it. I haven’t had as much opportunity to teach in the schools, but I have a lot of people who like to hear me perform and so I incorporate that in many of our events. Hi I am a College student that was at the event and i am doing an essay on my psychology class that relates to the event. I was wondering if there is any website i can look at that talks about the event so that i can acquire information for my essay or any information i can receive to relate this event to my project. I will appreciate it. Thank you for your time. Have a great day. Thank you for attending the event. It was wonderful to have a large contingent of students there. We have our wmdfoundation.org website and you can find us on Face Book and Twitter as well. If there is anything we can tell you about the event please don’t hesitate to ask. I could also put you in touch with our intern who is working on the project over the summer. In August we will be working with several high school students from Iraq that are being brought to the United States by the San Diego Diplomacy Council. Let me know what kind of information you are seeking.